As the small living trend continues, many homeowners are realizing that living with a small kitchen can be tricky, to say the least. Kitchens have become multi purpose spaces and require planning to get everything in its right place. Do not despair! We have gathered simple and clever space saving ideas for small kitchens, anyone can adopt. Hanging things from the ceiling or on the walls will free up a lot of precious counter and cabinet space. A pot rack not only serves to free up space, but with attractive cookware it almost becomes art. A magnetic knife rack can leave an entire drawer open for a new purpose, while increasing ease of access to your tools. You can even place it underneath your cabinets, so you keep the walls free to hang something else. Keep clutter off your precious counter space with hanging baskets just under your uppers. TIP: We’ve seen beautiful kitchens with hanging racks above the stove. As pretty as they look, we don’t recommend using that space for storage. Grease will ruin everything you place there. Try adding pullout storage in the seemingly useless space around your refrigerator. It might only be wide enough for a spice rack, but sometimes you will be able to add a vertical pantry. Or you could get old fashioned and install a dish-drying closet. Invented in the 1940s, a cleverly hidden drying rack doubles as dish storage. Think outside the box. Or in this case, outside the cabinets. Use the outer walls to store cutting boards or heavy pots and pans. With limited space, pullout shelves are your friend. You can’t afford to let the far reaches of your cabinets go unused. Be smart about your space. TIP: Planning to Remodel Your Kitchen? Use our free Kitchen Remodeling Calculator to Find Out the Remodeling Cost Instantly. Nesting cookware drastically reduces the amount of space your equipment takes up, and the same goes for bowls, food storage containers, and the like. Some sets of mixing bowls and strainers are made to stack neatly inside one another, so if you’re purchasing new cookware, look for those options. If you already have all the tools you need, try reorganizing – with a little creativity, the items that currently take up an entire cabinet often end up occupying the space of one mixing bowl. Pegboards are a friendly alternative to store your kitchen utensils. Think of hanging there the unexpected: like measuring cups and spoons. You’ll clear up drawer space for less visually attractive objects. Place all of the objects you wish to display, and try creating a harmonious composition. Not only will it serve your storage goals, but it could become a cool and edgy wall decor. 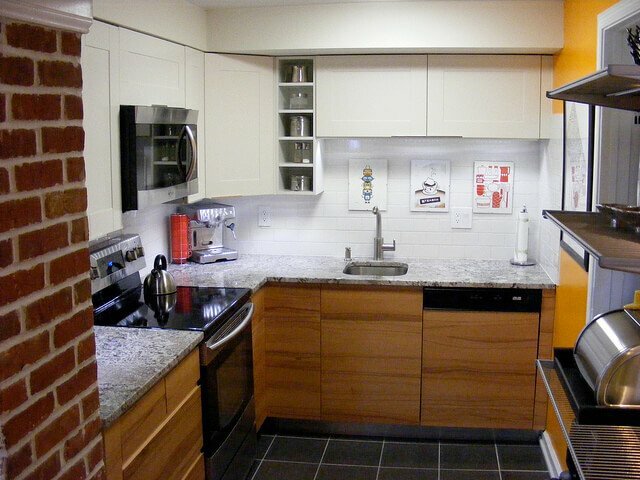 Open shelves are perfect for small kitchens, because they are less heavy than the cabinet alternative. The spaces will immediately feel more airy and light. However, if you tend towards clutter, this might not be the option for you. Open shelves require commitment to keep them in top shape. If you’re not a neat person, you might want to rethink your cabinet options. Use cool, light colors and minimal ornamentation on your cabinets. Light is properly reflected from these colors, making the spaces brighter and tricking the eye to thinking they are actually bigger. Try opting for cabinets without hardware on them. This reduces the visual fragmentation to a minimum and provides elongated continuity to the space. Which in turn will give your space a visual boost. Think of everything you have stored in your kitchen. Is everything actually needed? For instance, can you move your bar to the living room? Make a list of your priorities and things you use everyday and try to find storage for less needed items outside of the kitchen. MORE: If you’re looking for smart storage solutions you can learn a thing or two from Scandinavian Kitchen Design. Why don’t the photos show the tips being described? Annoying!